The FireFlux experiment was conducted in 2006 at the University of Houston Coastal Center. The experiment remains as one of the first and most comprehensive grass fire experiments to date, and serves as a standard for testing coupled fire-atmosphere modeling systems. Fire front front moving towards the 43 m tall meteorological instrument tower during FireFlux, 23 Feburary 2006. FireFlux was featured on the cover of the September 2007 issue of the Bulletin of the American Meteorological Society. FireFlux was the first field experiment to simultaneously measure fine-scale atmospheric circulations, turbulence structure, and plume thermodynamics during a wind-driven grass fire. The data has been used by numerous research groups to better understand fire-atmosphere interactions and for model validation. The data set has become the international standard for fire-weather model evaluation. More information can be obtained in the BAMS article. Fire-induced winds are generated by the development of low pressure regions at the flame front. This causes the winds to accelerate into the fire from all directions depending on the ambient wind conditions. Fires also cause air to be brought down to the surface from aloft. This can also help drive the fire front. Below is an example of the observed fire-atmosphere interactions that occurred during the fire front passage. As the fire front approached the tower, the winds reversed in direction and decreased in velocity. Then as the fire passed the tower, winds increased in magnitude to three times the ambient. Strong updrafts associated with the fire plume are observed as well as downdrafts that occur just behind the fire front. Time series of 1-s average data from the 2-m sonic anemometer on the main tower. (a) Wind speed is indicated by the blue line and wind direction by black circles. (b) The vertical velocity, w where blue crosses are the instantaneous 20-Hz tilt-corrected values and the solid black line is 1-s data. (c) Fine-wire thermocouple temperature (T). (a) The convergence zone is indicated by CZ. (b) The region of downdrafts is indicated with a small red arrow (Clements et al. 2007). So how hot do fire smoke plumes get? Plume temperatures can vary depending on the fire intensity, ambient winds, and other factors. During FireFlux, plume temperatures were measured using fine-wire thermocouples mounted on the 42-m tower. The maximum temperatures remained within the lowest 10-15 m above the ground. In higher winds, the fire spread rate increases and the hot plume is blown downwind of the fire closer to the surface. Observed plume temperatures measured using fine-wire thermocouples mounted on the 42 m tower (Clements 2010). Simulations of the FireFlux experiment by Filippi et al. (2013) using MesoNH/FOREFIRE coupled fire-atmosphere numerical modeling system show similar characteristics to observations (http://anridea.univ-corse.fr). Dupuy, J-L, F. Pimont, R.R.Linn, C.B. Clements, 2014: FIRETEC evaluation against the FireFLux experiment: preliminary results. VII International Conference on Forest Fire Research Proceedings, 17-20 November 2014, Coimbra, Portugal. Kochanski, A. Jenkins, M., Mandel, J., Beezley, J, Clements, C.B., S. Krueger, 2013: Evaluation of WRF-Sfire Performance with Field Observations from the FireFlux Experiment. Geosci. Model Dev., 6, 1109–1126. Filippi, J.B., X. Pialat, C.B. Clements, 2013: Assessment of FOREFIRE/MESONH for wildland fire/atmosphere coupled simulation of the FireFlux experiment. Proceedings of the Combustion Institute. 34(2), pp. 2633-2640. Achtemeier, G. L., 2013: Field validation of a free-agent cellular automata model of fire spread with fire–atmosphere coupling. International Journal of Wildland Fire, 22, 148–156. Clements, C. B., 2010: Thermodynamic structure of a grass fire plume. International Journal of Wildland Fire, 19, 895-902. 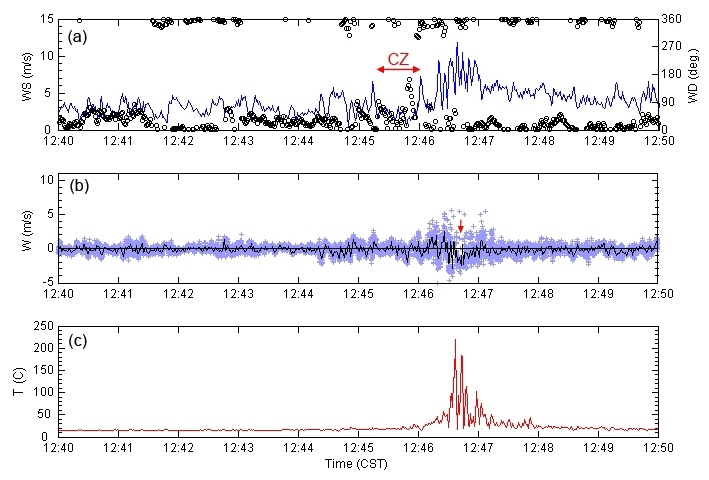 Clements, C. B., S. Zhong, X. Bian, W. E. Heilman, and D. W. Byun, 2008: First observations of turbulence generated by grass fires, J. Geophys. Res., 113, D22102, doi:10.1029/2008JD010014.